It is being tagged as "Invercargill 2.0" and city leaders are talking up a series of developments that will overhaul the city’s CBD. In the second of a two-part series on the transformation of the area, Sharon Reece takes a closer look at three big projects in the pipeline. 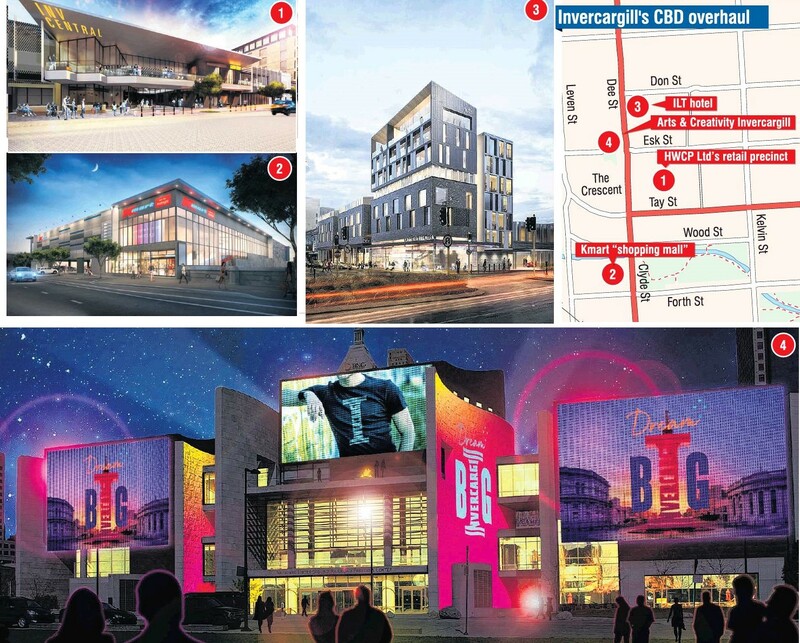 An overhaul of Invercargill’s central business district made up of a range of projects over the next five years will render the inner city brand new, say those involved and those who support the massive plans. The four major projects planned are a retail precinct in the heart of the CBD, the city’s first 4.5-star hotel, a Kmart shopping mall and an interactive arts centre. The projects will tie together in what one of the developers believes will push the city from "1954 to 2054" in just five years. As reported in the Otago Daily Times last week, in the most ambitious of the projects, an entire block, encompassed by Esk, Dee, Tay and Kelvin Sts, would be demolished to make way for the $200 million retail precinct. Just a block away, the Invercargill Licensing Trust (ILT) plans to build a $40 million 4.5-star hotel, which would "complement" the precinct. ILT chief executive Chris Ramsay said it was an exciting time for the city. The first new hotel the city had seen for 40 years would be "more than just a hotel". On the ground floor alone, the hotel would boast a cafe, house bar, niche bar with a laneway, and restaurant far enough from reception that it would cater to locals as well as hotel guests. Atop the six to seven-storey building, an indoor/outdoor space could be utilised as a function space with a 360-degree view of the city, he said. The hotel and retail precinct projects were a natural fit. "They are hugely complementary; they want our project to go ahead just as much as we want theirs. "Us building a hotel means we’ll be feeding guests into that CBD. Them creating a really good CBD means they’re going to be creating the need for people to want to stay there." The hotel alone was something entirely new to Invercargill, offering a level of service on par with other cities in New Zealand, Mr Ramsay said. When the retail precinct was taken into account, it changed the dynamic of the city altogether. "It can only but look different when you’re going to knock a block down. It’ll be Invercargill 2.0. "How many other cities in this country would be able to do what we’re proposing to do? "Wouldn’t it be cool to say we’re one of the most progressive cities in the world?" Directly opposite the CBD redevelopment, centred on Wachner Pl, comes a more culturally focused project. The Southland Regional Development Strategy identified the need for a new arts centre and that has been answered in the form of the planned $16 million Arts and Creativity Invercargill. Council works and services director Cameron McIntosh said work had identified that a traditional art gallery might "not be well utilised", but an innovative art centre would deliver the rejuvenation the council wanted to achieve. "It will be a social hub. In what we are proposing, the people are the most important thing. We want to make it a more active and engaging place." The art centre concept incorporates gallery spaces, a performance art space, community meeting room, cafe, outdoor courtyard, children’s play area and a "wet area" for messy art, as well as a large-scale LED screen featuring on the building’s exterior. "[The arts centre] will have a really big transformative impact [on the CBD]," Mr McIntosh said. The arts centre was given the green light when the city council’s long-term plan was adopted, and construction is expected to start in 2020-21. A block south, behind the Crescent, perhaps one of the most anticipated projects is under way. A new Kmart for the city was referred to by many as Invercargill’s worst-kept secret, due to rumours circulating for years before it was officially announced in July this year. Just a hop, skip and jump away from the city centre, demolition has already begun at the site bordered by Forth, Clyde and Wood Sts. The Kmart will be accompanied by eight yet-to-be-announced tenants. Shoppers in the CBD have been reported to be delighted by the announcement, and some said it would even save a trip to Dunedin’s Kmart. HWCP, the company behind the retail precinct, said a walkway linking the Kmart with its own major project would help to ensure the projects would meld. "The challenge is, right, let’s find a way to link what is happening in Clyde St, through the Otepuni Gardens up and through buildings on to Tay St, so people are happy to walk both ways," HWCP Management Ltd director Scott O’Donnell said. "The Otepuni Gardens are beautiful. No-one goes to them, but they are beautiful. Let’s find a way to use that green space and link the two shopping centres together." Mr O’Donnell had championed the change in the city centre and said he hoped to see the city go from "1954 to 2054" in five years. The time for change was now, he said. "This is our last chance. "I moved back to Invercargill in 1995 and I think it was at the end of the last [Tiwai Smelter] upgrade, and the place was starting to spiral downwards. It can’t happen again. We’ve actually got to find a way, through leadership, spending, structure, to make sure it’s a buoyant economy." Mr Ramsay agreed with Mr O’Donnell’s comments, and said now was the best chance the city had ever had for an overhaul. "If it doesn’t get the backing and the support that it needs now, I don’t know how many Scott O’Donnells there are in the world that would be able to drive it as he has been," he said. As a Southland old boy I think these developments are great. But a rooftop outdoor functions area in Invercargill......overly optimistic isn't it? ?